I decided to post some of my favorite logos I did over the past year not to show them off, but to make a point. The point being that the client sometimes gets in the way of good design. As a designer I try to put my foot down by explaining imagery and good design principles, which usually works, but sometimes that is not enough. Many times there are extenuating circumstances that drive a logo. Since I like to end on a high note I will start with the loses. Starting with a design I did for a friend of mine. In the first draft phase I wanted to make a simple / classy design that said high-end yet personified the company name. The client / friend nixed all my first drafts and decided to have a logo that incorporated actual telephone poles from a photo he took. I advised against this but it was his vision. He ended up with a scene, that incorporated a font treatment, that looked good on business cards, stickers, t-shirts, and a van but it was not what I would call an actual logo or identity. Colt Ford was a client I did some spec work for though a promo merchandise vendor. I saw his t-shirts, slapped together this logo, and thought I could make something cleaner and more classy. The look I was going for fed off the identities for Colt (.45) and Ford Motor Company. In the end his merch style was gritty and dirty looking which probably lead to the demise of this logo. Perpetual Groove was an odd situation. The client loved the logo and I really liked it too. It was a new clean, more thoughtful direction for their identity. The band Perpetual Groove was ready to move with this when they had a sudden management change and we never heard from them again. I did this one for my current employer. This was the best design from my draft one phase. I believe the company may have changed names or decided they weren't ready to move forward. I am not sure but I am not always in the loop when such things happen. Now we arrive at Skoob Press, one of my favorite recent identity designs. This is one where the client trusted my direction and we ran with it. We both agreed that an owl is a great symbol of knowledge and an eye catching element. 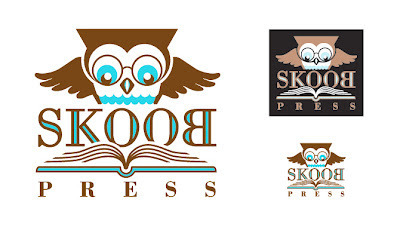 Since Skoob is "books" spelled backwards we also played of that concept. We both liked the final product. In the end my job is make clients visions a reality and that is what I do. From a design perspective, you win some and you lose some.